I have been looking at several new blogs and websites over the past few weeks and found some awesome ones. Not only awesome sites but the content and ideas are truly wonderful. One of those blogs I found was Playing with Words 365, a blog for building and learning speech skills on daily practical experiences. The author, Katie, is a pediatric speech language pathologist! 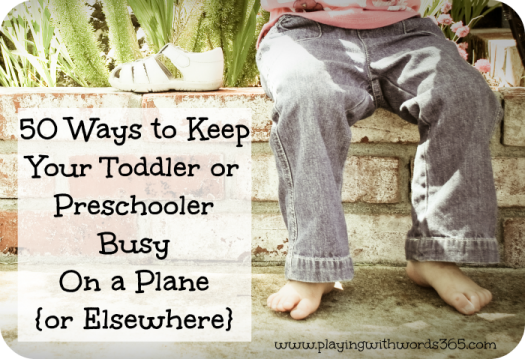 As we are all aproaching the end of school and start of summer travel, I found a great post on 50 ways to travel with a toddler/preschooler on a plane and other transportation modes. I think all nannies and those who travel with kids could use some refreshers or new ideas for upcoming travel. Let us know if you have tried any of these or have some to add! We love hearing awesome tips on keeping kids busy and happy! Last time we went to Hawaii, I had a 19 month old and was pregnant with my son. We also had my 14 month old nephew as a fellow traveler. This year, we will have my two kids, 3.5 and 1.5 and my two nephews, 3 and 13 months. Four kids 3.5 and under. So of course, I have been busy trying to think of things to keep them occupied on our 5 hour flight. I am sure they will all nap for at least part of the flight (we have to get up very early) but that still leaves us hours to keep the brood happy. I decided to share with you ideas we used last time we went to Hawaii, along with many ideas I found during my online search. Whatever you choose to take with you, I do recommend that at least a few of your activities or toys be brand new for your little one. Airplane magazine activity 2: Play “I Spy” with the magazine pages. Open a magazine up to a busy page and play this classic game. “I spy something blue.” “I spy something pointy.” Etc. Card games: Your preschooler is probably ready to start learning simple card games like Old Maid and Go Fish. Teach her on the plane!